Blog » Harrogate Indoor Funfair returns to the Yorkshire Event Centre and Mumbler have 2 FREE tickets to giveaway! Harrogate Indoor Funfair returns to the Yorkshire Event Centre and Mumbler have 2 FREE tickets to giveaway! 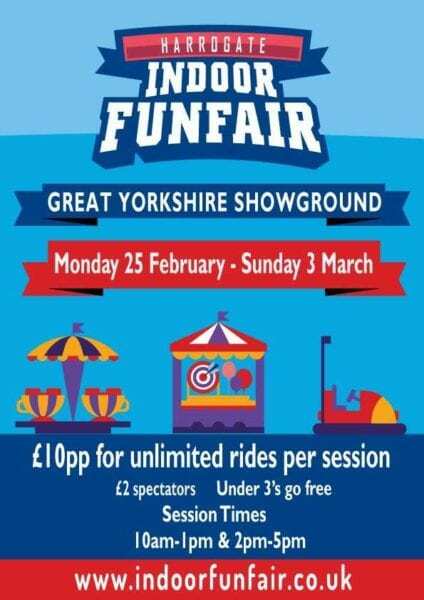 Harrogate’s indoor funfair for families will return to the Yorkshire Event Centre from 25th February – 3rd March after a hugely successful inaugural event last year. There will also be new rides including a twister, crazy bulls, jump and smile as well as a large selection of children’s rides. All rides are free once admission is paid for, either in advance or on the gate. Admission is £10 on the gate for either the morning session (10am – 1pm) or the afternoon session (2pm – 5pm). Under 3’s go free, spectators are £2 and a new online only offer is £35 for a group of four riding. Tickets are available online with no booking fee and visitors are advised to book in advance as each session will be limited to avoid queues. The funfair will run from Monday February 25 to Sunday March 3, with free parking. Food and drink is available from the Yorkshire Event Centre’s onsite café and there will also be traditional funfair games. The Yorkshire Event Centre is part of a family of businesses on the Great Yorkshire Showground including Fodder, Pavilions of Harrogate and the Harrogate Caravan Park as well as events Great Yorkshire Show, Countryside Live and Springtime Live. WIN 2 FREE TICKETS TO THE INDOOR FUNFAIR WITH MUMBLER!! To enter, simply contact us with the words ‘FUN FAIR’ before midnight on Monday 4th February 2019. The prize is to win two tickets for any day/session subject to availability. The fair runs from 25th February – 3rd March. The closing date is midnight on Monday 4th February 2019. The winner will be notified by email or Facebook private message by Wednesday 6th February 2019. We take your privacy very seriously, and will NOT share any of your details with any other party. Your details will only be used to contact you if you win.